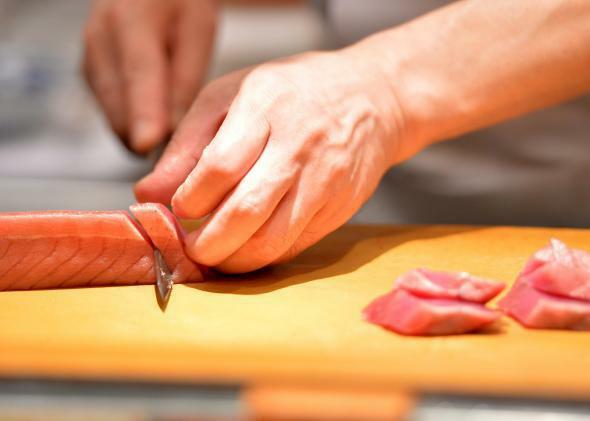 What’s it like to train to be a sushi chef? A chef slices up tuna at a high-end sushi restaurant in Tokyo in 2013. It was year 2000 when I knocked the door of a sushi restaurant in Los Angeles, after seeing a help wanted ad in a newspaper. I had no previous professional culinary career. The only professional experience I had was working at a college food service cafeteria. I had nothing else to show in my résumé, which I did not bother to bring. During my interview with the owner of the restaurant, I said, “I will do anything.” The owner looked at me in the eyes and said, “OK, you start in two days. Come back then.” I think I got the job because I was determined. That’s how I started my sushi training. For the first two weeks, I stood inside the sushi bar and watched other sushi chefs work. That was all I did. Depending on how you look at it, you may say that I was not allowed to do anything because I was just starting. I look at it as part of the best training I received. There is a saying in Japanese culinary art: Steal with your eyes. What it means is that you learn by watching. Traditionally, Japanese consider watching to be the best way to learn any art. They say that as long as you pay enough attention to what’s in front of you, everything you need to know is right there. Of course, the key point being “as long as you pay enough attention.” That is the key. Your curiosity and love of art will make a significant difference in your learning curve. I paid attention to how other chefs made sushi—their body movement, how they cut fish, how they made rolls and nigiri, which plate they used, and how they plated. Plate for sashimi was different from the one for rolls or nigiri. Things appeared simple. The reality was that nothing was easy. We had prepped for a couple of hours before the restaurant opened. On my first day, I was asked if I had my knife. I never knew that I had to have my own. The next day, they ordered a sushi knife for me, which I ended up using for more than 10 years. The very first thing I needed to learn was to tell which fish was which, because I needed to place them in the refrigerated sushi display case on top of the sushi bar. Each fish had to be placed in the same place every time—just like your local supermarket pasta section where spaghetti is on the top shelf and linguini on the second. It took me several days until I was able to distinguish the difference between hamachi, halibut, and snapper (all white-looking fish). Cutting vegetables came next. I (of course) cut my finger several times in my first week. Making of sushi rice did not seem so challenging because at least I grew up eating rice. All I had to do was cook rice and add sushi vinegar mix. I suppose anyone can make sushi rice. Not everyone can make it taste exceptionally good. The most important part of making sushi rice is to keep the grain of rice in tact while you mix sushi vinegar with big wooden paddle (called shamoji). After a several days into my training, one of the chefs showed me how to make an inside out (rice out) roll. I practiced using leftovers. It took me a couple of months before I felt comfortable serving my rolls to customers. For the first several months, I made rolls only. If I needed to cut fish, other senior chefs made slices for me. It was not that they did not allow me to touch the fish; they were showing me how to slice fish for rolls so that I could learn. After rolls came nigiri. No matter how many times I watched and saw in a book, I could never figure out how they made the nigiri. I think the main reason being that most sushi chefs move so quickly when make nigiri. It’s like a magic trick. The way I learned how to make nigiri was to make “imitation rice ball” using Kleenex and plastic wrap. I had this rice ball all the time (even when I was not working) and practiced my hand movement for at least one month. Forming the small rice ball for nigiri was only the first challenge. The second challenge comes in the form of slicing fish. Slicing fish involves knowing the fish—how to cut, how thin to cut, which direction to cut, which part to cut, and knowing how it would taste when it’s cut in a certain way. I say that it probably took me anywhere from three to six months before I felt comfortable to make nigiri (or serve it to customers). Sashimi, perhaps, is one of the most difficult technique a sushi chef must learn. I learned how to fillet fish after one year into my training. You may have heard or read that traditionally in Japan, one must spend at least three to five years before he is allowed to touch the fish. I cannot say if things are the same over there now, but from my experience and what I’ve heard from other sushi chefs, things are lot different here in U.S. Many told me that they learned how to make rolls on their first day. I think there is no better or bad way to learn. What’s important is that the way you are learning is the best way for you, meaning you feel good about your training. I worked for a year and a half at the first restaurant, and I moved to a different restaurant. Over my professional culinary career, I worked for about 10 different sushi restaurants in Los Angeles and San Francisco. Each restaurant had a different recipe (like what to put in spicy tuna) and style (how to cut fish). I met and worked with several chefs who had training in Japan. From them I learned how to make tamago, kohada (gizzard shed), katsuo (bonito), and many shellfish (giant clam, red clam, abalone). I love the art of sushi, and it is very interesting. What I love about it is its simplicity. There is nothing to hide and are many things done to it (meaning prep work). It looks simple and complicated at the same time. Just like any other art, there is no end—one can go as deep as he wants to or stop. Variety of fish seems endless; even the same fish has different taste from year to year, so you need to adjust how to you prep them. After 15 years, yes, I can make nigiri, sashimi, fillet a whole fish and run my own business. Have I mastered it? Yes, some. But there’s still a lot to learn. If you compare me to a sushi chef like Jiro Ono, who has more than 65 years of experience, I am still a baby. I am still learning the art ,and so far it seems that there is no end to it. Sushi: Which kinds of sushi would best test a sushi chef’s ability? Professional Chefs: How does one become a chef? Food: What is the most overrated and over-praised food?